I trust that most of you will by now have bought your first day covers of the Royal Mail stamps featuring classic British comics? They really are excellent as is the mini-Dandy No.1 (reprinting 12 of the first issue's 28 pages) and the brief history of comics that accompanies it. 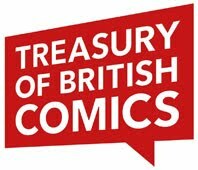 However, there is one little glitch that perpetuates a common myth of British comics. 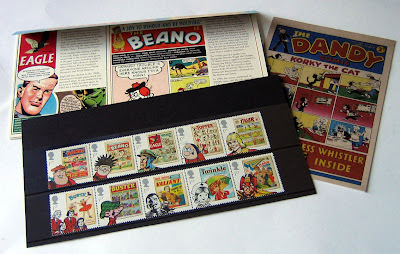 In the folder that comes with the stamps, Graham Kibble-White states "In 1937, DC Thomson launched The Dandy. This landmark title mixed rollicking adventure tales with robust comic strips that featured individual speech balloons rather than text blocks. 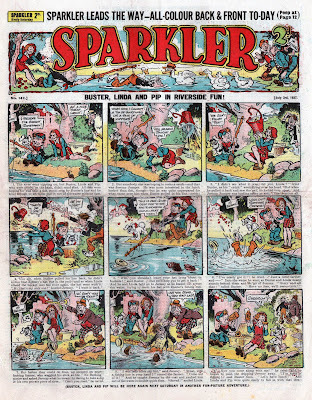 This innovation made the stories easier to follow and prompted the launch of The Beano in 1938, as well as setting the template for future comics." 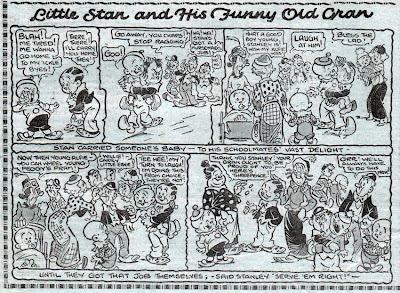 It's a mistake that James Chapman also made in his book British Comics, A Cultural History, when he wrote "While they maintained some text stories, Dandy and Beano introduced a new kind of picture strip that dispensed with text captions underneath the pictures and used speech balloons for dialogue." 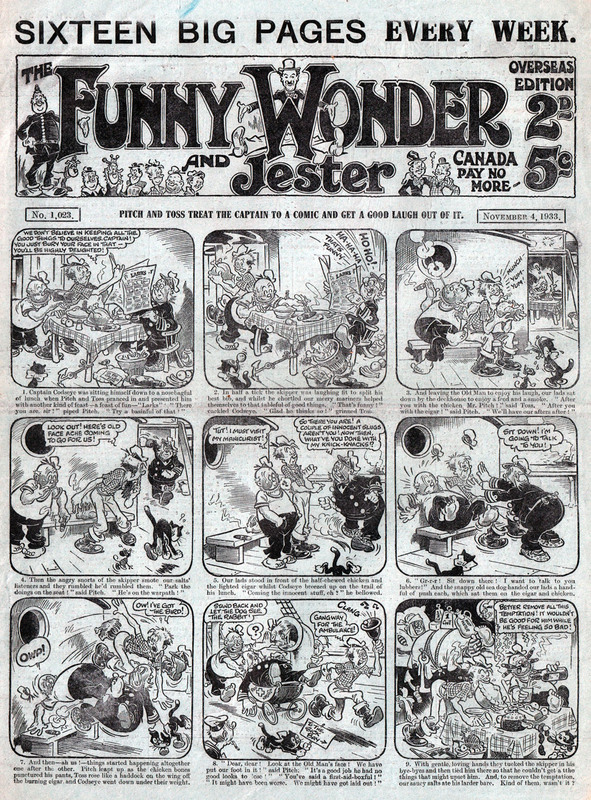 Inside that same 1933 issue, two strips that use word balloons, dispense with the text under the panels, and even have the sort of rhyming couplets that The Dandy and other DC Thomson comics were known for. That very same week, The Butterfly featured its regular strip Perky, which although features some text it's relegated to the foot of the strip rather than appearing under each panel. 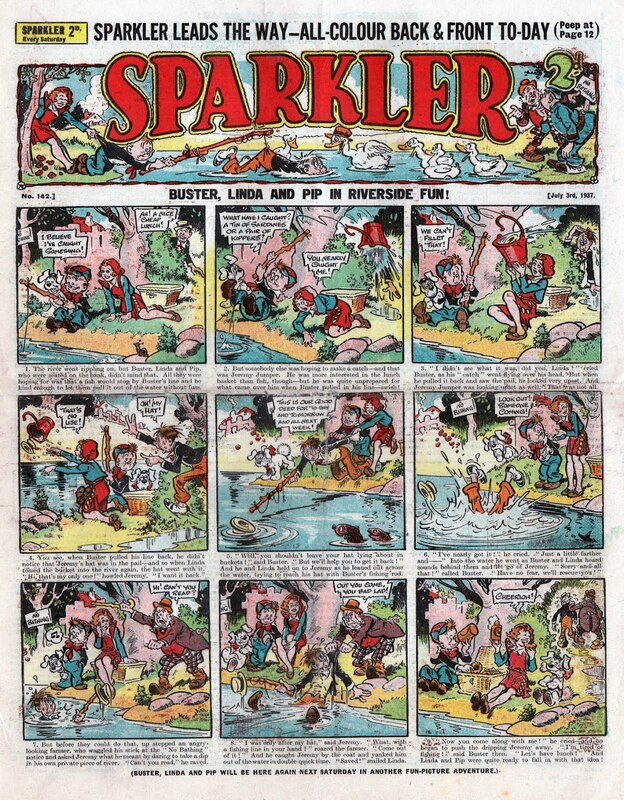 So, speech balloons and textless strips had been used frequently in British comics long before The Dandy debuted. So how did this myth arise? I'm not sure, but it's one that been doing the rounds for decades and I even believed it myself at one stage. (I may have even written an article or two years ago that's guilty of the same assumption.) 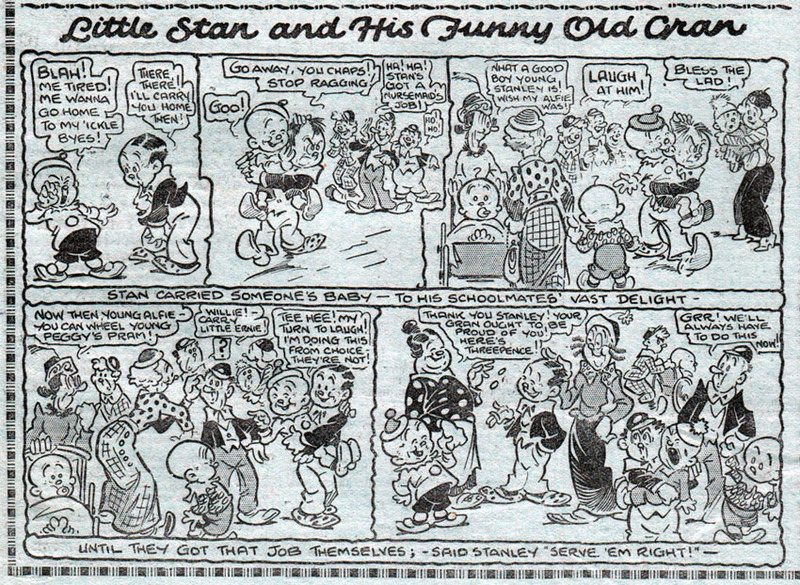 It seems to be an error made by some comic historians rather than originating from DC Thomson itself. Thing is, The Dandy was innovative when it arrived but the reasons why are harder to pin down. 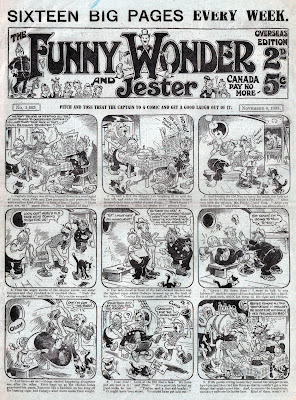 For example The Butterfly, Funny Wonder and other comics of the time dispensed with text on some humour strips but The Dandy dispensed with text on most of them. 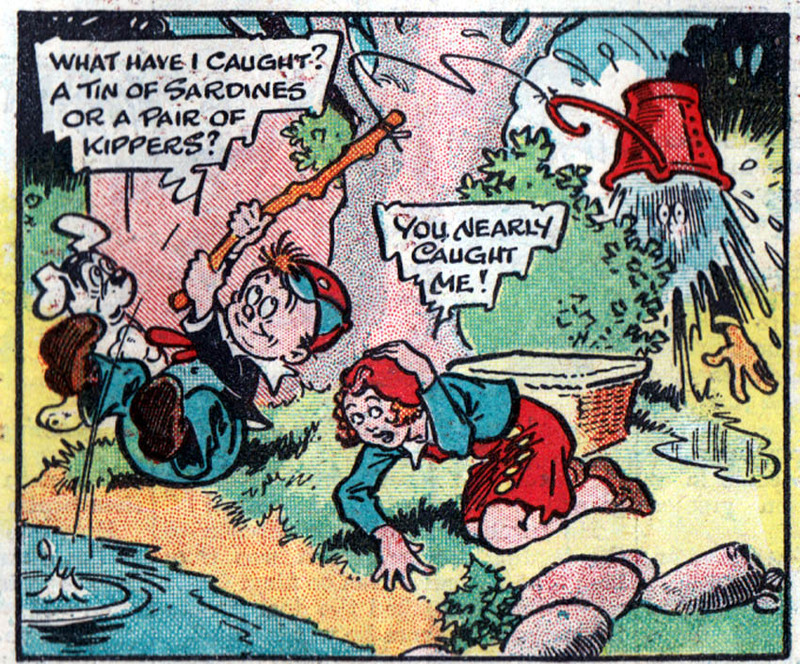 Basically The Dandy took its inspiration from existing British comics and expanded upon it. This gave the impression that The Dandy was a more modern looking and faster paced comic. Also, the tone of The Dandy seemed brasher and not as slick as those from Amalgamated Press. 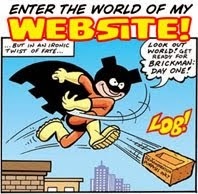 It seemed to have a different attitude than its rival titles, and, yes, that new-kid-on-the-block cockiness did inspire other comics. Perhaps the myth that The Dandy introduced speech balloons to British comics just makes for a simpler soundbite... but it's still wrong. By the way, despite that, James Chapman's British Comics, A Cultural History is still a cracking read and an absorbing study of the history and sociological significance of comics. Order your copy from Amazon here if you haven't already bought the book. another urban myth... such as teenagers did not exist before rock n roll in the second half of the 1950s. but i remember reading an article that was published in 1948 that makes reference to teenagers, but unlike you i do not possess the magazine anymore for evidence. It's interesting to see how far back speech balloons go (John Adcock has been running some examples from "Punch" in the 1870s). One thing I still don't understand about the hybrid text/speech comics. Why did the creators repeat the dialogue from the text block in the balloons, often word for word? Did they figure some kids would read the balloons only and others the text? That's an excellent point about Mickey Mouse Weekly Srew. 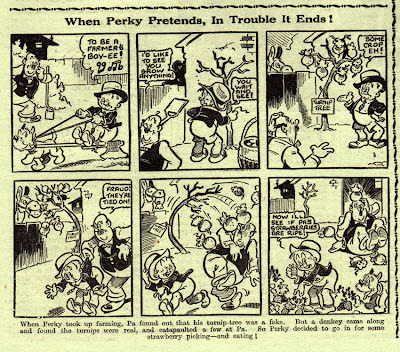 The earliest one I have is the 1938 New Year issue, published a month after Dandy No.1, but it would have course have been paginated before the publishers saw the Dandy. And yes, it features several strips that have no text captions and all have word balloons, and no doubt earlier issues were the same. 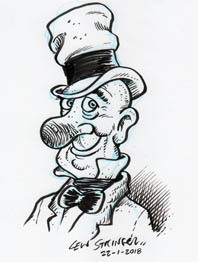 Yes, I think The Dandy WAS influenced by America, not only by American comic strips but also by cartoons. I think Korky the Cat was definitely inspired by Felix the Cat for example. @Smurfswacker, Apparently the story in text was an attempt to convince parents that comics had literary merit. Originally balloons were seldom used, but became more regular as the years progressed. I suppose they kept both so that they could still claim the text gave the comics some respectability, but I imagine most kids ignored it and read the balloons instead. Something else that's worth mentioning is that in the 1930s American newspapers were used as ballast on ships from America. 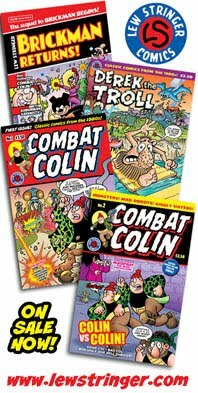 Some canny people used to salvage the comics sections from the Sunday papers and sell them on the streets in the UK charging 1/2p or a penny. Those comic sections were pure comics of course, using speech ballons and no text captions so it's likely they were a powerful influence on The Dandy as well. of course, I'm not quite sure on today, but Text under panels was pretty common still in the 1990s, where it was mostly used for children's comics (I openly admit I'm a Raggy Dolls Fan.. but i only have 1 issue and an annual *sigh). 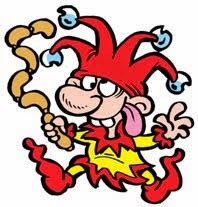 Problem is with rumours, is they often exist so people can 'pretend' that they know more then someone else.. a number of years back, i was talking to someone that was trying to impress with his knowledge of Guy Fawkes. Claiming to the world that his real name was Guido Fawkes, but he was called Guy by the English and it was a common mistake.. Until i pointed out to him that he was born Guy, but when he joined the Spanish against the English, he took on a Spanish name, Guido (basically the Spanish venison of Guy). At one time or another, most people are caught be rumours because they are soo common, and so many news/information sites make mistakes and run with them, that we just believe what we are told is the truth.. I saw speech balloons in British political cartoons as early as 1817! Another common myth in America is that they were invented by Ocault for The Yellow Kid around 1895... nonsense! "Word balloons containing characters' speech had appeared in political cartoons since at least the 18th century, including some published by Benjamin Franklin. Their origins can be traced back to speech scrolls, painted ribbons of paper which trailed from the mouths of speaking subjects, depicting their words. These were in common European use by the early 16th century and similar devices had appeared in Mayan art between 600 and 900 AD. Outcault's word balloons in the Yellow Kid influenced their basic appearance and use in subsequent newspaper comic strips and comic books." I've got a Happy Mag from 1933 with "Mr Rabbit and his Baby Bunnies" - which is apparently a reprint of Harrison Cady's American Peter Rabbit strip. All speech bubbles and no text, and I assume that's not the only example available to the people of Britain in the early thirties. An example of speech scrolls is people saying "Vivat Rex" or "God save the Kynge" on the frontispiece to the Great Bible of 1539. More modern-looking balloons (though rather elongated and at funny angles) can be seen on cartoons about the Peterloo Massacre, which happened 'a while' before The Dandy. And on the subject of silly rumours getting out of hand, somebody complained in spaceship away that British people in 1950 didn't say "OK". 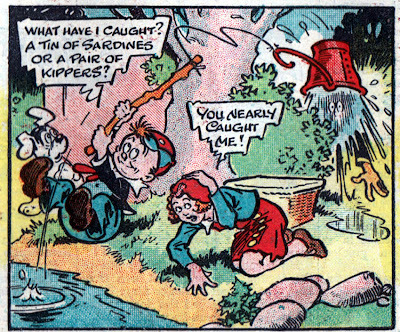 Earliest example of "OK" I've seen in a British comic? 1911! Hi Mike, You're right, the speech balloon has been around for centuries. However I don't think anyone's been daft enough to claim that The Dandy invented them per se. 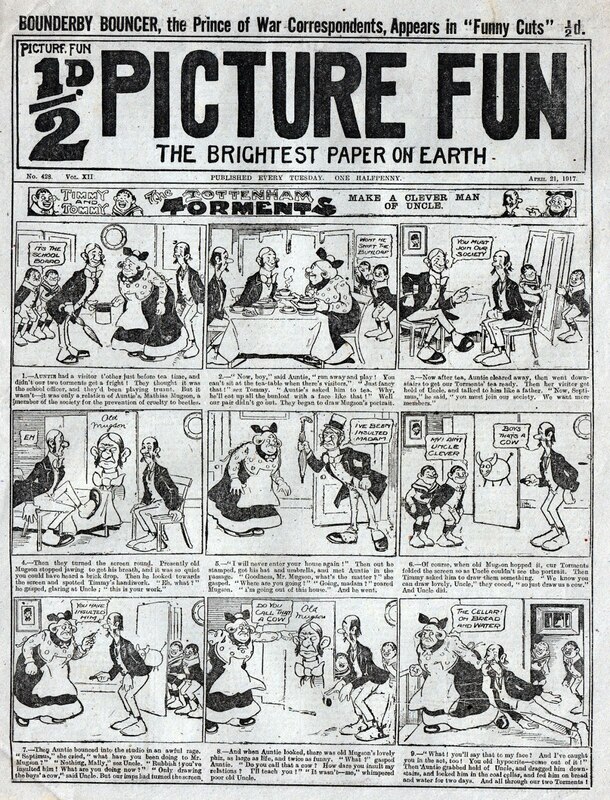 The claim made by historians was that it was the first British comic to use them (which obviously wasn't the case). Theres another myth that needs sorting out. How do oyu read the speech bubbles? Left to Right, top to bottom. Lew do you have a certain way of doing it when drawing them? They're just placed in the order that one would naturally read, ie: left to right. (Or right to left in the case of Manga.) Generally, the character who speaks first should be on the left of the panel. If any comics are confusing it's probably down to the artist (or letterer) not understanding the simple basics of telling a story in comic form. 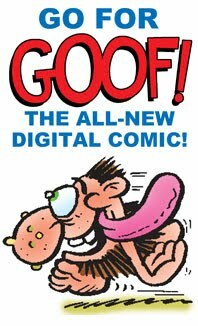 my favoutite comic book artist is Roy Wilson...that look of shock face clutching "LAWCKS !!" is an eternal image for me.. I'm going to spread it around a bit today. 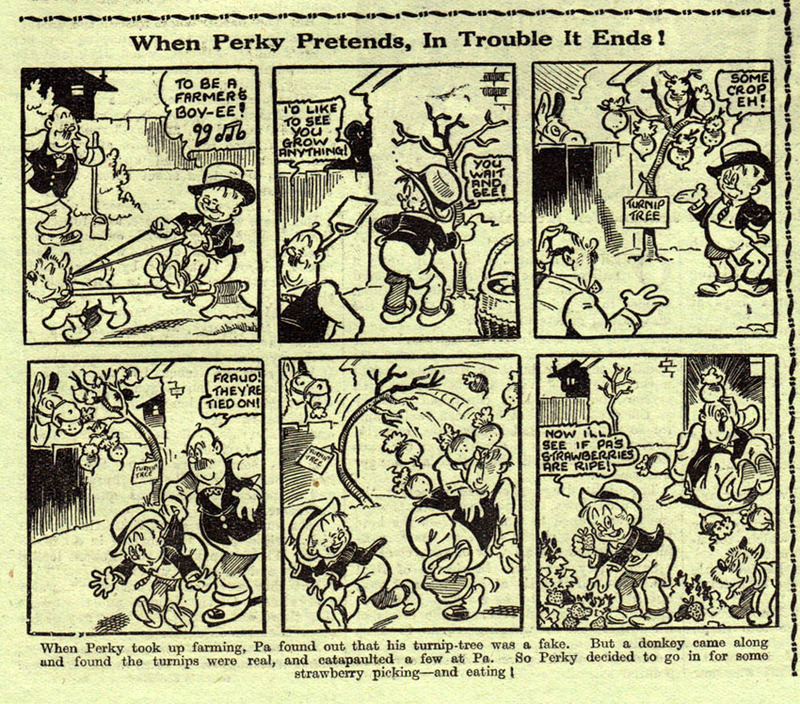 Mickey Mouse Weekly launched in Feb 1936, so almost two years before Dandy. Word balloons on some US strips in MMW, others had captions. No coincidence, I'm quite sure. US Sunday section: not only sold individually, but occasionally crudely stapled between very crudely drawn covers with a UK price on. 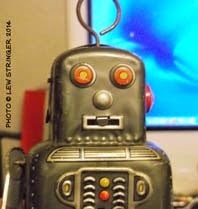 I bought one of these from Phil Clarke a couple of years back. Can't find it now to date it. Looked like a semi-homemade job, very small scale, though the cover was printed, not hand-done by a schoolkid! Good to hear from you, Guy. Yes, I've covered Mickey Mouse Weekly in other posts and it did indeed feature strips without captions on some pages. As for the stapled US funnies, my mum used to tell me about those. They'd be sold in the back yards of British pubs in the 1930s for a penny. Quite often it'd be a disappointment as the contents would be ones they'd read before. I suppose it was a similar thing that Thorpe and Porter did in the sixties, binding together US comics as 'Double Double Comics'. Love the "back yards of pubs" angle, Lew! I have always assumed that T&P, having distribution deals with DC and Marvel at the time (? ), had a contractual right to bundle together their own unsold (returned ??) copies in the UK. I strongly suspect that the pub back yard trade was non-legit. Thanks for confirming the MMW notion. I found one interior page online, from an issue within the first few months,which showed a word-ballooned, uncaptioned page, but it was a tiny thumbnail. I extrapolated from there. Can we assume that the captioned strip pages were UK-originated? Perhaps they were reworked US pages, as people have been saying was done in Italy, for example. Given that, I would think it's natural that sequential-panel strips would also use them, but then I don't know much about the history of comics. It was very pleasant to stumble across this blog, though. Interesting stuff. Really good to see interior pages from such an early MMW, Lew. I didn't mean to imply that I thought any pages in MMW might have come from Italy. I was referring to information I heard recently, that in Italian Disney comics, before they surrendered to the word balloon, they whited out balloons from US pages, redrew a bit where need be, and replaced the word balloons with captions under the panels. I don't know exactly when this was. I wondered if the UK comic had ever had similar strips. I don't know for sure, Guy, sorry. I only bought a few MMW out of curiosity to show on this blog. 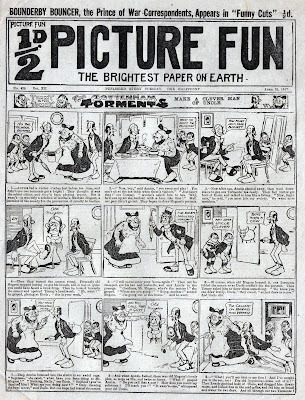 As far as I've seen, Odhams reprinted the US newspaper strips as they were, (but possibly recoloured them). There was probably a bit of cropping and editing in places to make them suit the UK format but no text captions were added as far as I know. 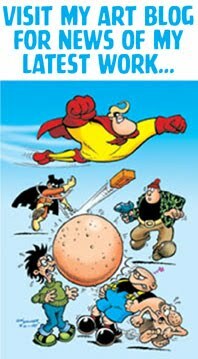 MMW was quite a progressive comic so it's not likely they'd have tried to imitate the traditional UK comics of the day. Kid Cops of the 1930s! Here comes the Man From Space! Toxic is 200 issues old today!